A cleanser to improve the transdermal penetration of any product applied to the skin at a later time. Scrub: thanks to the roasted almonds this cleanser perfoms a very effective exfoliating action. Mask: Honey and wheat starch moisturise and soothens the skin. 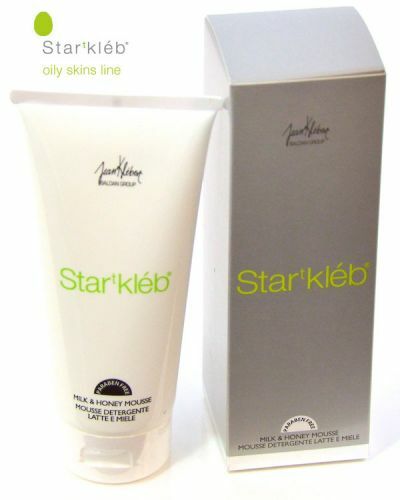 Start Kléb dermo-cosmetics for young skin are specifically designed to improve the beauty routine for skin that is sensitive and delicate or oily and acne-prone. Aqua(water), Cetearyl alcohol, Caprylic/capric triglyceride, Ethylhexyl stearate, Propylene glycol, Polysorbate-60,Phenoxyethanol, Dimethicone,PEG-20 stearate, Sodium polyacrylate, Mel/Honey, Disodium EDTA, Sodium dehydroacetate, Ethylhexylglycerin, BHA, Parfum (Fragrance), Hydrolyzed milk protein.